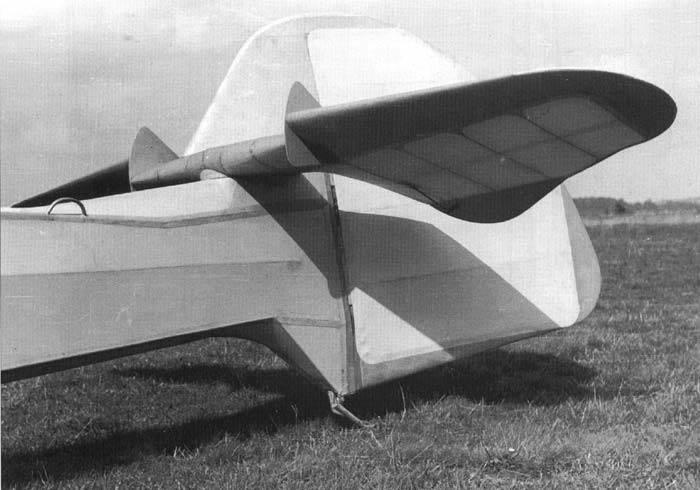 This was a continuance of the Akaflieg Munich’s tradition of cheap to build, practical and light sailplanes with welded steel tube fabric covered fuselage and wooden fabric-covered flying surfaces, which had performances comparable, it was hoped, with the best sailplanes in production at the time. Its lightness is demonstrated by its empty weight of 250kg (5501b) and its load carrying capability of 200kg (4401b). This was creditable for a 19m span two-seater which achieved its best L/D of 1129 at 80k/ph, and its min. sink of 0.7m/s at 65k/ph. This was a considerable speed performance at the time, considering its lightness. However, because of its 4401b load, its wing loading was relatively high, being 23.95kg/m2 (4.911b/sq.ft). At the time wing loadings for high performance cross country sailplanes were about 411b/sq.ft. 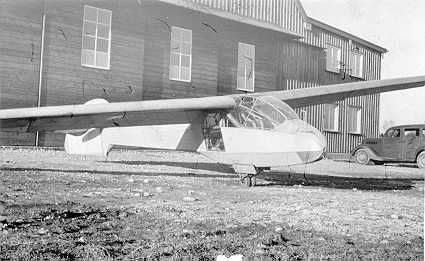 The Kranich’s wing loading was only 3.91b/sq.ft, and this was considered a fast glider then. Out of habit, one also used aileron. Therefore, rudder É. Nothing happened. Rimsting came ever nearer. Still we kept going straight on. Donnerwetter! … what nowu Rimsting within gliding distance dead ahead. Would use of full aileron in a stall bring about a turnu That didn’t work either! This damned foolproof Mu-15 profile! There was only strong sink straight on… height 50 metres. Where can I emergency landu On the house roofs or pancake in front of the church toweru ‘Drill for petrol!” is an old pilots’ saying, so shove the nose down. Above was the thick canopy of a tree. Pull out over an orchard. Little trees gave way before us. A thicker tree came up and bored in crackling beside the fuselage and the wing, bringing us to an abrupt halt … three metres from the first village house. At last, for the first time I drew a deep breath. “Hello, what about you in frontu” Gentle groans and sounds of undoing of straps. With some haste , the canopy was removed. Out of the house rushed the inhabitants from their lunch, serviettes at their throats. That was something! Superficially, there was nothing wrong with us. Our Italian had lost a few buttons from his winter coat, which we sewed on. That evening, of course, it was necessary to celebrate our “birthdays”. But what had happened to the Mu-15u The leading edge D-box was considerably damaged. The port wing had come adrift from its rear fuselage fitting and was therefore swept forward. The fuselage was undamaged, but behind, the rudder had gone … which had been obvious during the last minutes of the flight. It is obvious that the Mu -15 was intended as a possible Kranich replacement. 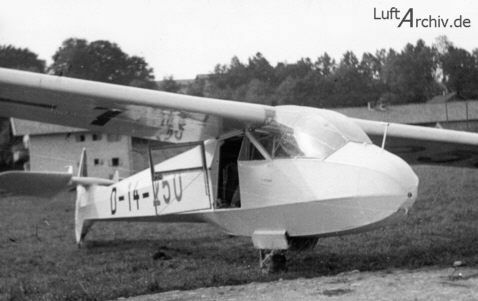 The Kranich 2 was then in general use for training and high-performance flying, but it had very limited visibility from the rear seat. It is worth comparing their statistics. The figures in Table 1 should not be taken as gospel, since most Kranich 2s weighed considerably more than 561lb empty. 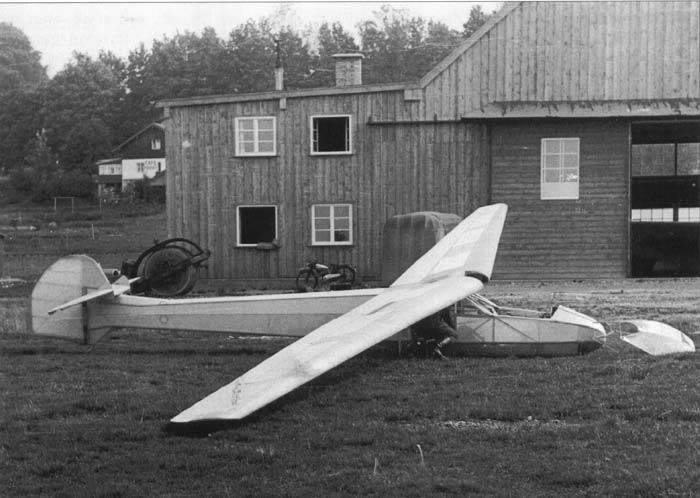 The Mu-15 was in theory a larger, faster, higher performance sailplane than the Kranich 2. The Mu offered more visibility from the rear seat. Visibility from the rear seat was the Kranich’s failing. However, the Kranich 2 had been well-developed since 1935 by DFS and was in large scale production. It was popular, a delight to fly, and had broken international records. The Mu-15 may have been a good attempt to better the Kranich 2, as the Mu profile has proved to be better at higher speeds when used in the Mu-23 and SF25 Falke motorgliders. However, the Mu-15 ailerons were ineffective. One wonders whether the long wing was torsionally stiff enough to have stood more of the trailing edge being used as ailerons. One can understand why on such a relatively fast ship of the time there was a wish to improve its low-speed performance with flaps. As it was, the Mu-15’s aileron response was so poor, that when threatened with a landing on a village, an attempt was made to turn with opposite aileron, which should have stalled the wing and caused it to drop in the direction of the intended turn. But the foolproof, almost unstallable Mu profile did not stall. With the large rudder missing aft, the C. of G. would have been further forward than normal. It is clear that the war stopped further development, but we believe that something of the Mu-15 lingers on in the Mu-23.